In this guide we’ll look at the best RC submarines. What Is The Best RC Submarine? This ThorRobotics RC sub is one of the best if you’re after a model that produces quality footage without the enormous price tag. This RC sub arrives ready to run and has a fantastic HD camera. Enjoy real-time underwater footage up to a depth of 3m, alongside a wireless connection so you can easily transfer your pictures and videos over. With a brushless motor and LED lights, this motor moves seamlessly underwater. Your videos and pictures will be stable, while the small size of this sub means you can take it with you on holiday. It arrives totally ready to go, and can be controlled up to a distance of 100m. Next up, we’ve got the Sub-Mariner camera by Sea Peep. This mini camera is easy to maneuver underwater – it can seamlessly dive, advance, emerge, levitate, rotate and trim. This camera is movie and photo shooting supported. The footage is bright and sharp, and the feeder attachment will help you attract the fishes for even better footage. It’s perfect for fish tanks, with a controlling range of 2m. The camera is perfect for getting a fish’s perspective, and the micro size means it’s easy to take with you when you go away. This Jujuism mini submarine is great value, and the body is durable and smooth. The lights turn on automatically and are extremely visible underwater. With a 6-channel control, this RC is seriously fun. It can move forward, backwards, left, right, dive and surface. The sub is smooth and seamless underwater, and is perfect for pools, ponds, rivers and lakes as it’s easy to control. This RC arrives ready to run and has a small Ni-Mh rechargeable battery. The perfect present for kids and adults alike! Perfect for kids, this My Toots RC submarine is equipped with a bunch of features to add to the underwater fun. This model is bright yellow, has a control distance of 5m and a max depth of 1.5m. The camera is good quality, while the body is both durable and strong. The best bit? This RC comes equipped with fish feed equipment to attract the marine life for footage. All your pictures and videos can be easily downloaded via USB. Finally, this model has an LED light it can flash in the water, and it’s easy to maneuver whether you’re floating, sinking, turning left or right. It arrives ready to go. If you’re after something to entertain the kids during bathtime, this eMart Mini RC sub is the perfect choice. It’s a great stocking filler or birthday present, complete with a built-in battery and USB charger. This little submarine goes forward, backwards, left and right. It can also dive and float upwards with ease. It runs for 15-20 minutes, and takes just 30 minutes to charge. The bright yellow design is perfect for kids, and the controls are simple so even very young children can have a go. It can be controlled to a depth of 1.5 feet, although if your kids are playing with it in the bath I’d recommend putting the remote in a plastic bag! Whether you’re after high quality footage of brightly colored coral and fish, or a fun bathtime toy for the kids, RC submarines are readily available and seriously popular! While old-school RC subs are very basic, newer models are far better made and more technical. What this does mean however, is that some models aren’t so suitable for beginners. RC submarines for kids or beginners should be simple and user friendly. If it has a camera, it should be good quality and easy to operate. If you are looking for a toy for a child, then cheaper, plastic subs are fine. If you’re after something to take away with you on vacation, ensure it’s suitable for salt water. Before you spend your money on an RC submarine, be sure to prioritize what’s important to you. Buying a submarine you can’t control and subsequently losing it is frustrating and expensive! It’s best to start small and master the basics, before you move onto something more complicated. Follow the guidelines on depth and you’ll be rewarded with an RC submarine that lasts. Different submarines have different prices depending on the features and quality. Those with good cameras that can withstand greater depths can be very expensive, while toys suitable for baths and pools will of course, be a lot cheaper. More expensive models will also have LED lights so you can spot them underwater, and an attractive design. The motor will be more powerful and they’ll be able to be used in salt water – not just swimming pools or bathtubs. RC submarines with more power can dive further and are generally more fun. If you’re using your RC submarine for photography, you won’t need much power – just a camera, but if you’re after more of a thrill, a high power RC is the best option. Where you are planning on using your RC submarine will determine the depth you need. If you’re after a child’s bath toy, a depth of just a few feet will suffice. If however, you want to get high quality footage of the fish or coral on your holiday, a depth of a few meters is necessary. The depth could mean that the submarine will lose control if you exceed it, or if you go too deep, the submarine could break completely. RCs are only equipped to handle a certain amount of pressure, so ensure you don’t go deeper than its designed for. An RC submarine with a camera is one of the best ways to get quality underwater footage. They are unlikely to disturb the fish like swimming would, and a good quality camera will capture high quality and bright footage. The better the camera the more expensive the RC, but if your primary reason for buying one is to get great pictures and videos, it’s worth the investment. 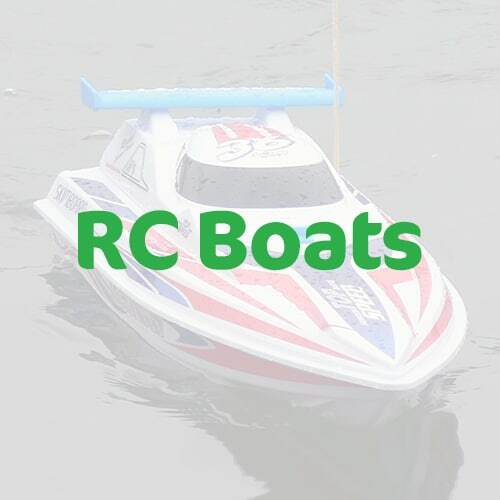 10 Best RC Boats that are Lightning Fast!